O’Neill’s Matt Watkins received the William M. Plater Civic Engagement Medallion. In his four years of nonprofit and public service experience, O’Neill public affairs major Matthew Watkins has been busy. Among the many projects he took on in addition to his schoolwork, Watkins created a local veteran resource database in South Bend, connected people to resources to transition to sobriety, worked on community outreach and grant projects, created and piloted a lead remediation program, helped address food deserts in Indianapolis, and supported community outreach efforts for Indianapolis Mayor Joe Hogsett and South Bend Mayor Pete Buttigieg. He also served as a research assistant for the IU Public Policy Institute’s Center for Civic Literacy and other university groups. His full plate is a testimony to what he says is a calling to help improve the communities in which he lives. Ashleigh Wethington received the William M. Plater Civic Engagement Medallion. 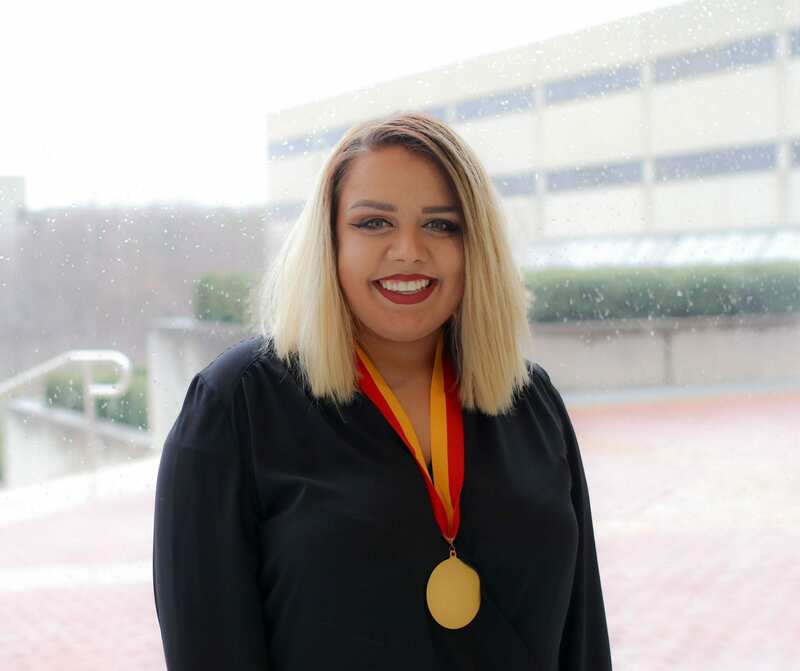 Ashleigh Wethington, who finished her criminal justice degree with O’Neill in December, says if someone would have told her three years ago that she would be an award recipient she would never have believed them. During her sophomore year, Wethington was the victim of a violent assault that resulted in extensive injuries and prolonged recovery time. She says she had to withdraw from classes that semester, a move that plunged her further into negativity and worry. But that point of view has shifted. 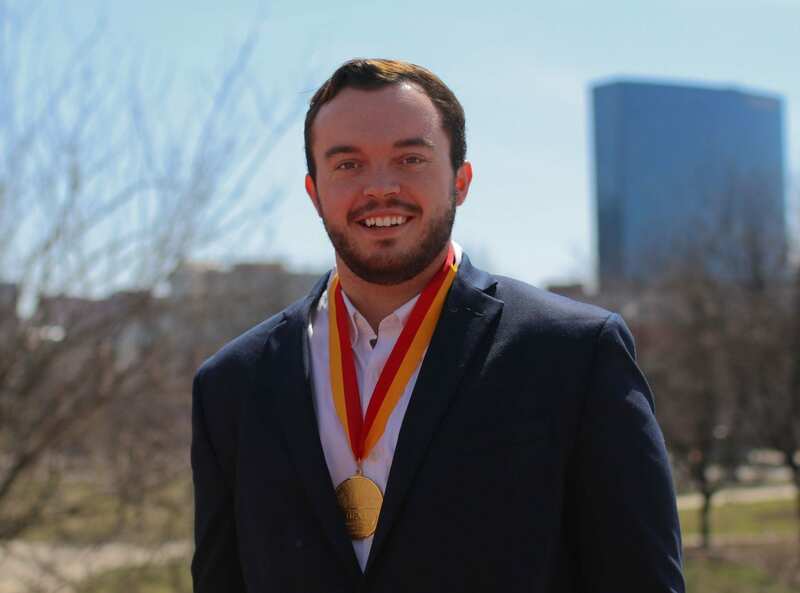 Wethington is one of three O’Neill students who received the William M. Plater Civic Engagement Medallion for the 2018-19 academic year. We spoke with Wethington about her experiences and the award. 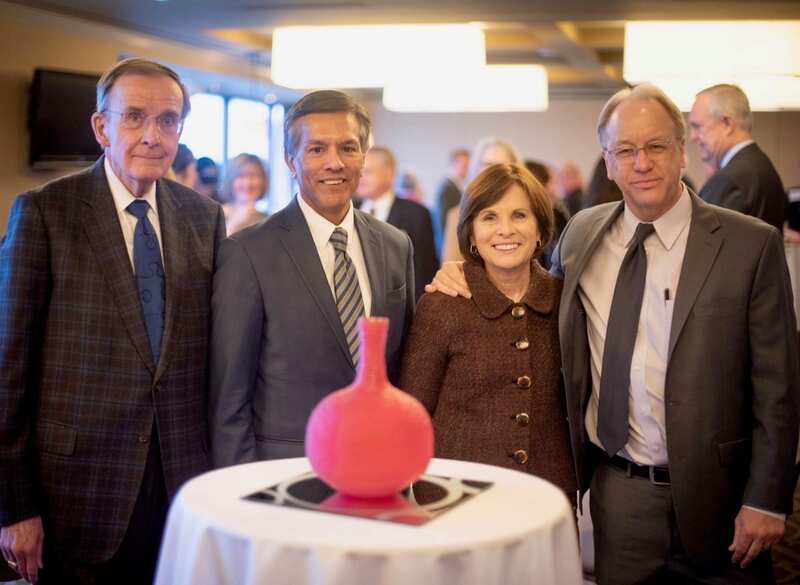 Moira Carlstedt stands with (L-R) with John Krauss, PPI director Thomas Guevara, and Brain Payne, president and CEO of the Central Indiana Community Foundation, as she receives the 2018 John L. Krauss award–a handmade glass sculpture from local artist Ben Johnson–at the O’Neill School’s Champions of Public Policy event. Carlstedt, who has served as president and CEO of the Indianapolis Neighborhood Housing Partnership for the past 21 years, was presented with the John L. Krauss Award for Public Policy Innovation. The biennial award is given to an individual or entity for applied research or activity that helps the state of Indiana and/or Indiana communities with real-world solutions. 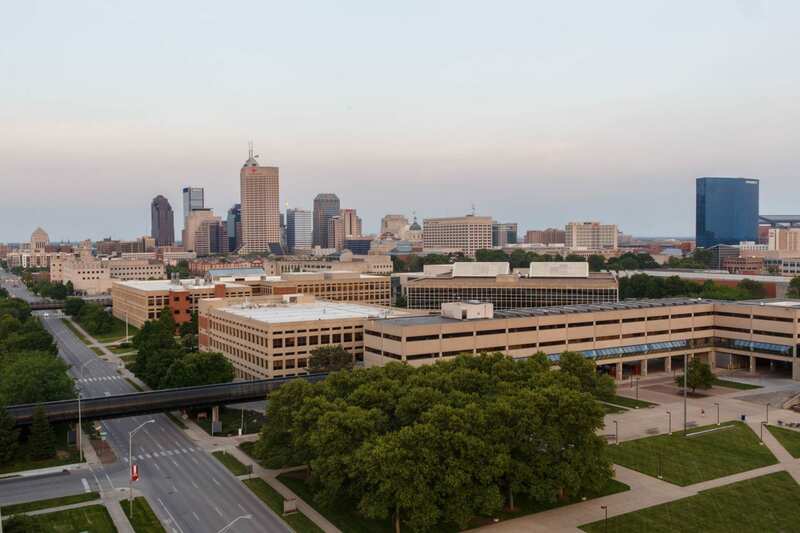 On Friday, April 26, a fleet of yellow bicycles will depart from IUPUI at 9 a.m. and spread out across downtown Indianapolis. These teams of students have a collective goal of gathering as much trash as possible from Indy’s streets and parks, and recycling anything they can. In 2015, the O’Neill School’s student council wanted to create an event that would focus on the principles of sustainability. They developed the concept for the Indy ReCYCLE Ride and collaborated with the IUPUI Sustainability Council, Pacers Bike Share, and the Indianapolis Cultural Trail to bring the event to life. The first ReCYCLE Ride came to fruition in April 2016, timed to coincide with Earth Day as a reminder to students to be mindful of recycling and choosing a more sustainable lifestyle. 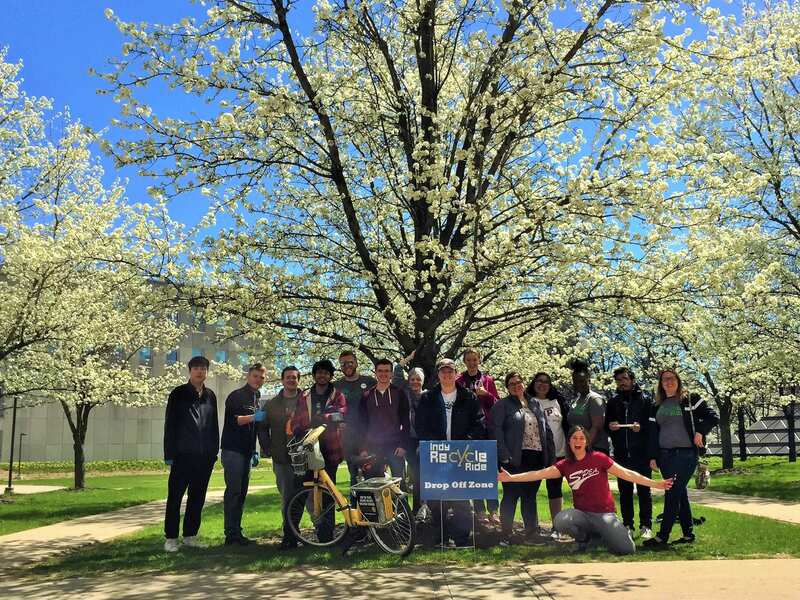 On the morning of the event, teams of students and staff gather near the Pacers Bike Share across from the Campus Center. There are games and giveaways before the event begins. Then, the teams ride off, fanning out across the city to compete to bring back the most trash. At the 2018 ReCYCLE Ride, O’Neill Sustainable Management and Policy major Melissa Kidulas said the event was an easy way for everyone to give back to the community.